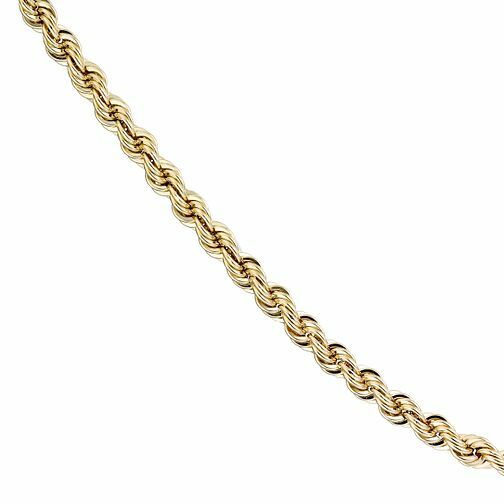 Get a stylish twist on a classic chain with this 9ct yellow gold rope. Measuring 20", this is a versatile piece of necklace perfect for everyday layering. 9ct Yellow Gold 20" Rope Necklace is rated 2.0 out of 5 by 2. Rated 1 out of 5 by Anonymous from Product is bad quality! Item has broken twice in two different places in the space of two weeks. Expected it to not be a hollow chain and also for it to be heavier than it is. Such poor quality, I have just paid £40 for it to be soldered together and it has snapped once again! Am thoroughly disappointed as this was a gift for my 18th birthday and I can no longer wear it as it is broken once more and do not wish to pay a sum once again. I am scared to even wear the chain now incase it breaks as it is so flimsy and fragile!